1-1/2-inch Punch Plyers with Punch Bit. No. 00. Home » 1-1/2-inch Punch Plyers with Punch Bit. No. 00. These 1-1/2-inch Punch Plyers with Punch Bit. No. 00. are the Top Punch Plyers in the Picture. These Punch Plyers will hold only ONE Punch Bit that is NOT interchangeable. Please Choose the Size That You Desire in PLacing Your Order. This Smaller Hand Interchangeable Punch Holder DOES NOT come with any Bits. Punch Bits Are Available Separately from Hale & Co.; Please See RELATED PRODUCTS. This Set of Set of 13 Small Interchangeable Round Punch Bits Includes Sizes 00, 0, 1, 2, 3, 4, 5, 6, 7, 8, 9, 10, and 11 that fit the Smaller Hand Interchangeable Punch Holder, which also fit the 1-1/2-inch Punch Plyer and the 2-inch Punch Plyer. 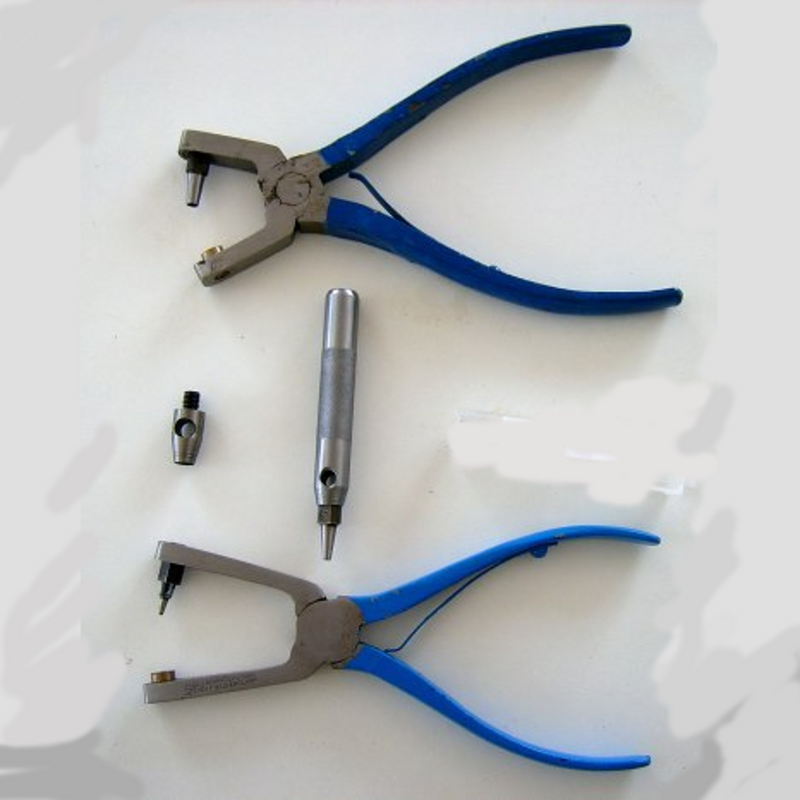 The Set of 9 Larger Interchangeable Round Punch Bits, also available through Hale & Co., DOES NOT fit the Smaller Hand Interchangeable Punch Holder OR the 1-1/2-inch Punch Plyer OR the 2-inch Punch Plyer, but only the Larger Hand Interchangeable Punch Holder, also available through Hale & Co. This Set of Set of 13 Small Interchangeable Round Punch Bits DOES NOT fit the Revolving Punch Plyer, whose Bits are Not as Tall. All Hardened hand-Finished Hand-Forged Carbon-Alloy Steel with Carbon Spring Steel Spring. Smaller Hand Interchangeable Punch Holder. Set of 13 Small Interchangeable Round Punch Bits. Eyelet Plyers. Size 0. With Replaceable Eyelet Bit and Copper Bed. Eyelet Plyers. Size 1. With Replaceable Eyelet Bit and Copper Bed. Eyelet Plyers. Size 2. With Replaceable Eyelet Bit and Copper Bed. Eyelet Plyers. Size 3. With Replaceable Eyelet Bit and Copper Bed. Eyelet Plyers. Size 4. With Replaceable Eyelet Bit and Copper Bed. Larger Hand Interchangeable Punch Holder. 1-1/2-inch Punch Plyers with Punch Bit. No. 0. 1-1/2-inch Punch Plyers with Punch Bit. No. 1. 1-1/2-inch Punch Plyers with Punch Bit. No. 2. 1-1/2-inch Punch Plyers with Punch Bit. No. 3. 1-1/2-inch Punch Plyers with Punch Bit. No. 4. 1-1/2-inch Punch Plyers with Punch Bit. No. 5. 1-1/2-inch Punch Plyers with Punch Bit. No. 6. 1-1/2-inch Punch Plyers with Punch Bit. No. 7. 1-1/2-inch Punch Plyers with Punch Bit. No. 8. 1-1/2-inch Punch Plyers with Punch Bit. No. 9. 1-1/2-inch Punch Plyers with Punch Bit. No. 10. 1-1/2-inch Punch Plyers with Punch Bit. No. 11. Set of 13 1-1/2-inch Punch Plyers with Punch Bits. Nos. 00, 0, 1, 2, 3, 4, 5, 6, 7, 8, 9, 10, and 11. Set of 8 Large Interchangeable Round Punch Bits. 2-inch Long-Reach Punch Plyers with Punch Bit. No. 0. 2-inch Long-Reach Punch Plyers with Punch Bit. No. 1. 2-inch Long-Reach Punch Plyers with Punch Bit. No. 2. 2-inch Long-Reach Punch Plyers with Punch Bit. No. 3. 2-inch Long-Reach Punch Plyers with Punch Bit. No. 4. 2-inch Long-Reach Punch Plyers with Punch Bit. No. 5. 2-inch Long-Reach Punch Plyers with Punch Bit. No. 6. 2-inch Long-Reach Punch Plyers with Punch Bit. No. 7. 2-inch Long-Reach Punch Plyers with Punch Bit. No. 8. 2-inch Long-Reach Punch Plyers with Punch Bit. No. 9. 2-inch Long-Reach Punch Plyers with Punch Bit. No. 11. Set of 13 2-inch Long-Reach Punch Plyers with Punch Bits. Nos. 00, 0, 1, 2, 3, 4, 5, 6, 7, 8, 9, 10, and 11.